This Moroccan Crockpot stew is one of my favorite go to specialties, when I want a home cooked meal that is tasty, healthy and fun! 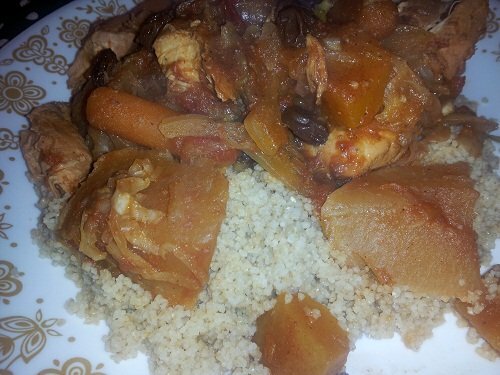 It is Chicken and Vegetable Couscous, and is traditionally served every Friday in Morocco. It is a flavorful stew that tops whole wheat couscous. We serve it Moroccan style from a huge serving dish, and we all eat out of the large dish and don't dirty any plates! This grosses some of our friends out, who we have invited to join us, but most of them quickly get over their fear and join the fun. We actually eat from the section of the dish right in front of us, and do not eat from someone else's section. That would be considered poor taste and bad manners in Morocco! It's a fun meal for everyone! Sauté the sliced onions, ginger, and garlic in the oil in a skillet. Place them in the Crockpot. Add the chopped carrots, potatoes, and turnips to the Crockpot. Brown the chicken in the oil and add to the Crockpot. Combine the seasonings and sprinkle them over the top and gently mix. Top with the raisins and the tomatoes. Cover and cook on high for 4 to 6 hours. Add the squash, zucchini, parsley, and the garbanzo beans the last hour before serving. Serve over a dish of whole wheat cooked couscous placed in a large shallow round serving dish. Make a well in the center and place the stew in the well. Place the dish in the middle of your table, with soup spoons strategically placed, and eat your section of the meal that is in front of you. Do not dig into your neighbors' space either, even if it looks better! 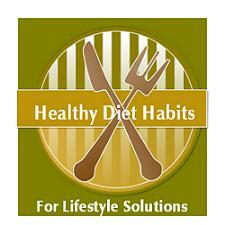 Many different cultures integrate many vegetables into their meals, which is a healthy diet habit. This recipe is a great addition to your fall menu when root vegetables are abundant. Enjoy!